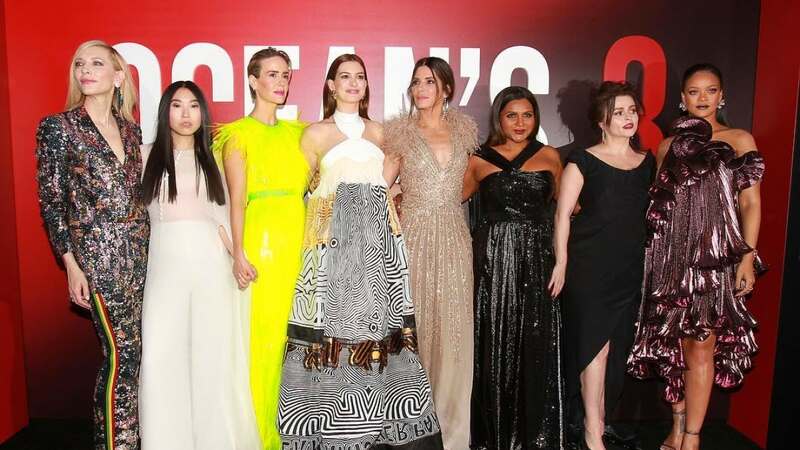 "Ocean's 8" stars Sandra Bullock and Rihanna shone on the red carpet Tuesday. Bullock sparkled in a champagne-colored Elie Saab dress with sequin detail and feathers at the shoulders. The actress plays Debbie Ocean, the sister of Danny Ocean (George Clooney), in the new film. "Ocean's 8" follows Debbie and her crew as they plan and stage a heist at the Met Gala. The cast confessed to stealing at different points in their lives in an interview with Entertainment Tonight at the premiere. "Ocean's 8" is a female-led spinoff of "Oceans Eleven" and its sequels, which star Clooney, Brad Pitt and Matt Damon. The new movie opens in theaters Friday, June 8. David Spade posts tribute to Kate Spade: "She was so sharp and quick"